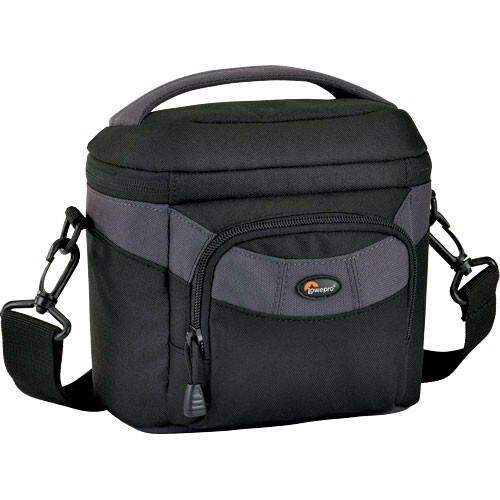 The Lowepro Cirrus 110 Shoulder Bag (Black) is designed for a digital SLR camera with zoom lens attached, and accessories; it protects both camera and lens from the outside elements. It is made from tough, water-resistant fabric, shock-absorbent closed-cell foam, and soft brushed tricot lines the main compartment to protect the camera and LCD screen against dust and scratches. There is a front exterior pocket for accessories, and a built-in media storage pocket, plus a spare battery pocket inside the lid. The bag can be carried by a padded, curved, easy-grip handle, a belt loop or a removable, adjustable, extra-wide shoulder strap.